I don't know about you, but I like to make the most efficient use of my time. When I first heard about a way to keep my chicken coop clean that didn't involve taking up my Saturday mornings, I was a little skeptical. But, let me tell you, this is one of the greatest time saving ideas in raising chickens. It is called the "Deep Litter Method." First of all if I told you I only cleaned my chicken coop once a year, with just a few minutes spent every week maintaining the litter, you would probably think that I was a little crazy. I am just a little crazy but not like that. Clean your chicken coop, by washing the walls and floor with a mild bleach solution(10 parts water and 1 part bleach). Let your chicken coop air out for a couple of hours(I clean my coop during the first warm days of spring). Sprinkle diatomaceous earth on the floor of the coop. Make sure you use the food grade version and not the one for swimming pools. This is very important. Now add a layer of 2 to 3 inches of pine shavings. I place a tray under my perch to catch the chicken manure. Once a week I put this in my compost pile. Once a week I sprinkle a dusting of diatomaceous earth on top of the litter and add a fresh layer of new shavings. A couple of times a week I will throw a little scratch into the litter to get the chickens to give it a little fluff. After a year I end up with about 12 to 14 inches of shavings. This will go to the compost pile after my yearly cleaning. That's all there is to it. I have been using this method now for a couple of years and have never had any ammonia smells. Also, the diatomaceous earth helps to reduce any pest problems. Give this a try, it will save you a lot of time. By the way, is it time for a new chicken coop? 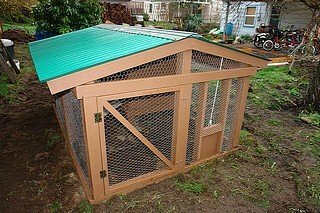 Thinking about building a new coop but not sure if those online plans you see are worth the time and money? In order to best help you in this area I took the time to preview a couple coop plan resources. 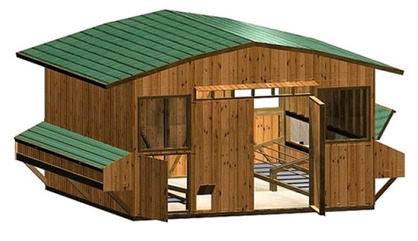 If you're looking for a quality set of chicken coop plans then take a look as I help simplify the process for you.